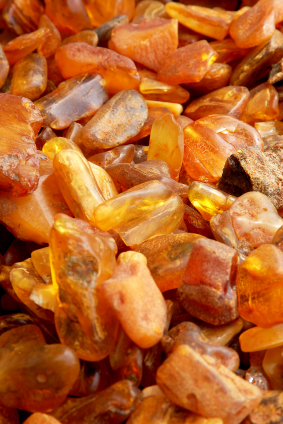 Baltic amber is largely used to make jewels. Amber is a resin that took origin thousands of years ago from some now extinct plants, and that has then fossilised over the millenniums from a soft and sticky resin into a harder and stronger one. Baltic amber took origin from extinct conifers, while Santo Domingo amber from pulse vegetables and sometimes giant sequoias. What makes amber very interesting is not only its appearance, which makes it very sought after to make jewels, or the ancient belief that this substance had amazing healing properties, but above all the fact it is incredible and extraordinary evidence of what life on earth must have been like in the past. This is due to the fact that, as a sticky resin, it “captured” all those fragments of life that were so unlucky as to get “caught” in it, such as vegetal (pollens, leaves, flowers, twigs) and animals fragments (insects as well as spiders, scorpions, millipedes, molluscs, small reptiles and amphibians, and exceptionally parts of mammals: hairs and teeth).